THE ITALIAN PIAZZA: "This is a wonderful book"
This is a wonderful book. I would highly recommend it to anyone who has traveled to Italy or would like to, to anyone interested in Italy in general and it’s fabled sense of la dolce vita, and to anyone interested in cities, history, architecture, art or the impact of technology on social life. Canniffe provides an excellent history of the political meaning of the Italian piazza from the Roman forum to the postmodern. The book reflects years of research transformed into a cohesive well-written text filled with beautiful photographs of Italian piazzas. 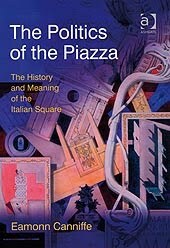 The authors enthusiasm for and extensive direct experience in piazzas throughout Italy is something that all readers will appreciate, regardless of the particular interests that bring them to the book.